With two daughters, I have two excuses (okay, three, if you count me) to stitch sets of things. 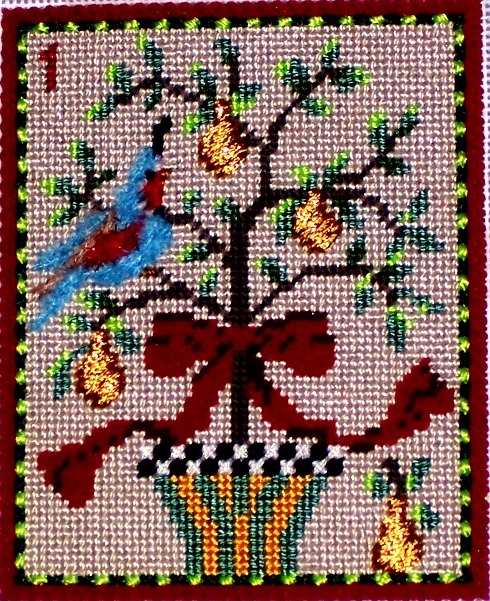 In addition to stitching the 12 Days of Christmas nutcrackers by JB, I have started Kelly Clark’s 12 Days of Christmas. They are classics—I can’t decide whether to have them finished as ornaments or as easel-backed stand-ups for a mantel or sideboard. And here’s a holiday special—buy 11 and get the 12th free. These are all available on our website. Also, this holiday season we are offering Free Shipping on US orders over $100. Hi there! I just discovered your blogs and they are wonderful. Here is a finishing suggestion. When you finish your Kelly Clark 12 days, have them done with an easel back but also add a small ring near the top on the back so that you have the option of hanging them also. I can use mine standing or,as I did this year, hanging in a garland. The easel back does not interfere.